Hi, folks. The last “Easy Ed Presents” live show of 2012—and perhaps the last one for a few months or more—is coming up on December 8. 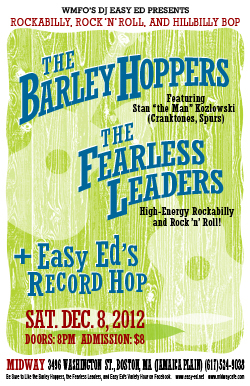 Saturday night at the Midway, with two rockin’ bands and a heap o’ cool 45s to keep you movin’. Hope to see you there! This show will be a blast, folks. Both bands are top notch, and Easy Ed will be spinning dance friendly rockabilly and rock 'n' roll. Come on down and bop around!